"Indian people are very spiritual and that attitude affects almost everything about the culture and atmosphere of India." We had an amazing time in India. The trip was extremely well organised and everything went as planned. I always felt some fascination with India. I think that is because of the image that we see in the media of a country of contrasts, the colours and chaos in the streets. 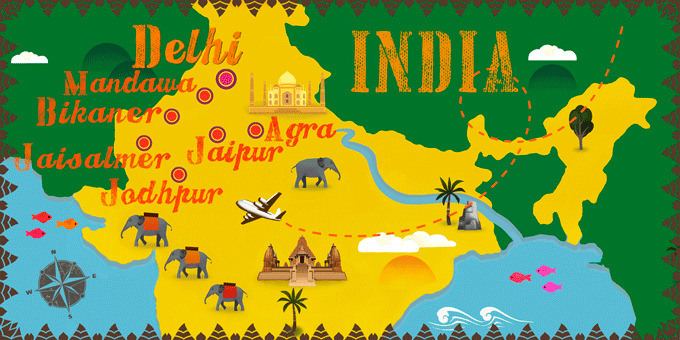 Also, India is often described as an unforgettable and overwhelming place to visit. I wanted to immerse myself in the Indian culture. The itinerary of Palaces and Deserts of Rajasthan felt like the right one for me as it took us a bit further than the main touristic points such as the Golden Triangle. I wanted to experience the more authentic India far from the crowds. 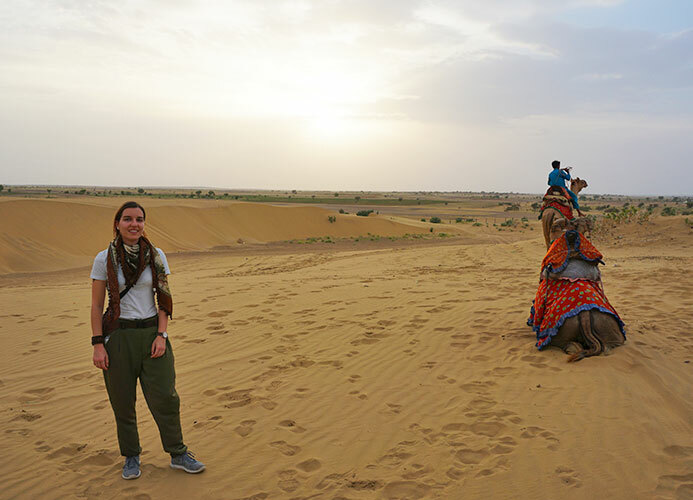 The itinerary included Mandawa, Bikaner and Jaisalmer, all places I had never heard of before, so the trip really appealed to my sense of adventure. I have always loved travelling and I try to visit at least 2 to 3 different places every year. In the past, I have mostly travelled within Europe but I have also visited countries like Japan, Sri Lanka and Morroco. India was our next stop and my fiance and I were really looking forward to exploring this colourful country together. I was expecting India to be incredibly hot and dusty, filled with the sounds of a thousand things happening at once. I was expecting lots of crowds and visible poverty on the streets but also very warm people. I was excepting amazing constructions and great landscapes, elephants, cows and spice markets. My expectations were certainly met, as soon as we arrived in Delhi! Mafalda and her fiance in Jaisalmer. India is definitely different from any other culture I have experienced. The immense respect that people seem to have for all living animals is amazing and unique. Learning that people save their first and last bread of every meal to feed to the local animals was astonishing. Most people live on very little yet still find something to share with other living beings. Their Hindu beliefs are very present in their daily life and routines. I was amazed by the kind way they treat strangers from the first moment they meet them. There also seemed to be a big sense of solidarity between communities. Locals are very curious about foreigners and they often asked us for photos, which made us feel like superstars! There were many memorable moments during the two weeks we spent away. Facing Delhi's never-ending traffic jams was quite overwhelming and the long journeys between cities were also memorable with the ever-changing landscapes and the constant hustle and bustle of people by the road, the animals roaming in the middle of the freeway as well as the sense of humour of our amazing driver! The temple of rats was an unforgettable experience but quite difficult to describe as it is an important holy site that is home to tens of thousands of rats. 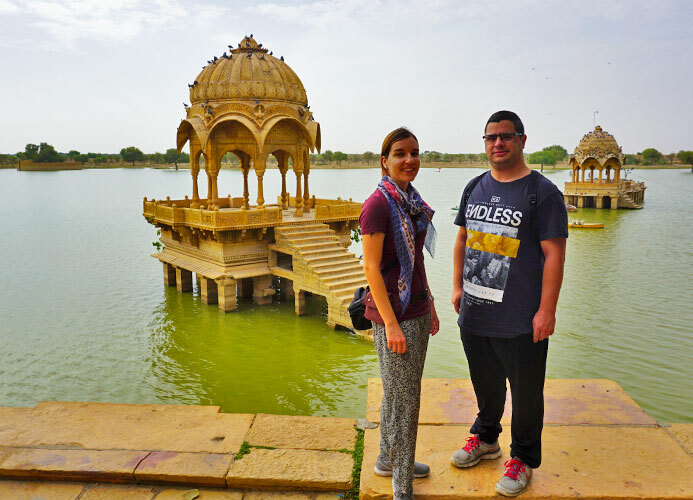 Both exploring the Golden Fort in Jaisalmer and the Amber Fort in Jaipur, which is surrounded by the most amazing landscapes were very special moments. The Taj Mahal is exactly like you see in the pictures, however being there personally is something else. It is hard to describe. Once you are there you do not want to leave. It feels like you just cannot get enough of it. It definitely lived up to our expectations. When I travel I love to buy souvenirs from local people, away from the main tourist markets. I bought a handmade painting on bamboo paper from a local art school at Mandawa and also a small marble painted elephant from an antique shop in Jaisalmer, both precious tokens to remember our time spent in India. Mafalda and her fiance in Mandawa. The weather was quite hot most of the time we were out there, between 30 and 39 degrees Celsius, so you should definitely be prepared for the heat. When it comes to Indian cuisine, to be honest, I am not the biggest fan of curries or spicy dishes. However, the chicken Briyani is a great non-spicy alternative and when served with a side of yoghurt, it is just delicious. Also, I could not get enough of their bread. We had naan or chapati with every meal and the garlic naan, in particular, was finger licking! It is hard to pick a favourite place from all the amazing sights we had the opportunity of visiting. Jaisalmer Golden Fort; all of Jaipur from the Amber Fort to the Water Palace, as well as the Taj Mahal and the Agra Fort, were just some of my favourites. Mafalda in the Thar Desert. I came away from the trip feeling like I had learnt a lot. Indian people are very spiritual and that attitude affects almost everything about the culture and atmosphere of India. The religious traditions in India teach people to be content, to be grateful and to regularly thank and celebrate god. The society places a great value on family life and respects nature like no other culture I have encountered. These values are a wonderful thing to try and implement into your own life and have certainly inspired me. It can be overwhelming to have to deal with crowds, chaos, unhygienic conditions, small rodents, and sometimes unwanted attention. However, the Indian people have such a positive outlook on life and such goodwill and kindness. In India, it seems that as long as people are getting their basic material needs met, they can be happy...with the right attitude! I would return to India in a heartbeat. The tour was an eye-opening experience that showed us many different sides of life in India and was a great introduction to a fascinating country. Our trip was an amazing experience and I would give Exoticca nothing less than 5 stars. Carry hand sanitizer with you. It is can be very handy, especially if there is no running water around when you are on the road. I was quite scared about getting a dodgy stomach during our trip to India but it did not happen at all. Just be smart and drink bottled water and eat in restaurants recommended by your guides.